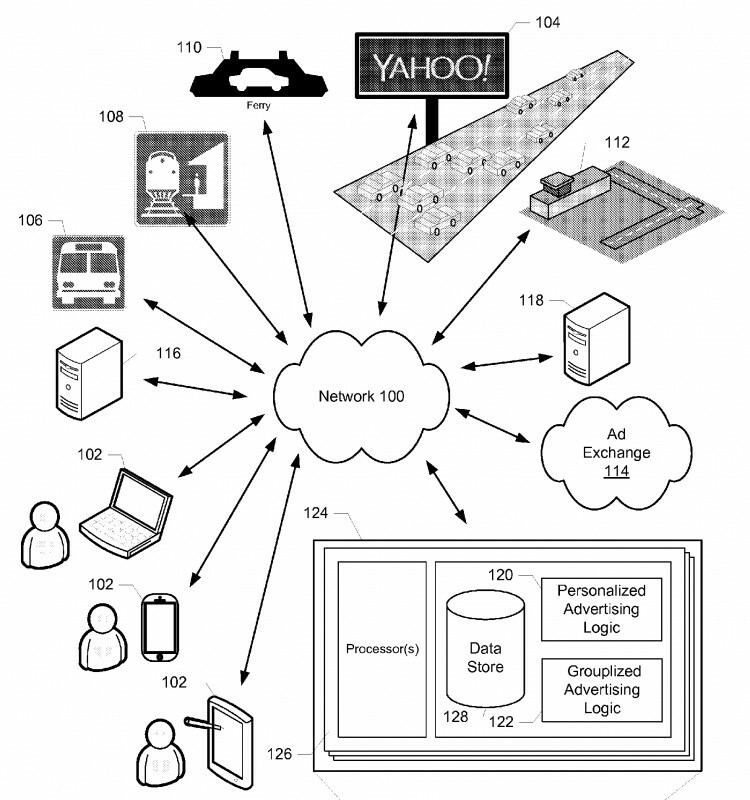 Yahoo has applied for a patent for a "smart" billboard that would represent a leap forward in data collection for outdoor advertising. According to a blueprint the U.S. Patent and Trademark office made public last week, the billboard would collect data through innovative sensors, cameras and microphones—a first for the medium. Not only could the data be sold to advertisers to help craft highly targeted creative for the billboard, it could be processed and read in real-time, giving the advertiser the ability to dynamically alter the creative depending on audience makeup and behavior. The billboard could collect "biometric data" on passersby to "determine whether the audience corresponds to a target demographic," according to the patent, which was reportedly filed in March 2015. It could also collect mobile device data or images to "identify specific individuals in the target audience," and "identify specific vehicles and/or drivers." Microphones could collect conversations that would reveal audience reaction to the ads, and proximity sensors could show how close people get to the billboards. "Eye-tracking sensors" could determine whether passersby are looking at the ads and for how long. Image recognition techniques and mobile data could be used to form a more focused profile of the audience. 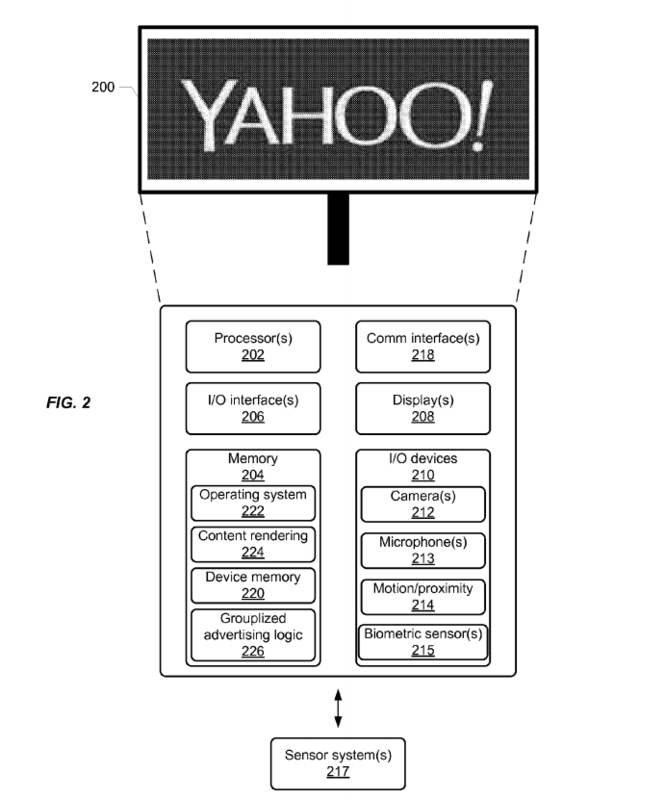 Yahoo did not respond to requests to comment on the patent. According to one example contained in the patent application, a Yahoo billboard placed on the side of a highway would be able to estimate the number of cars on the road, and even identify their make, model and year to determine the "socioeconomic status" of drivers. The data obtained, according to the patent, will be "stored remotely" and "under the control of one or more independent entities (e.g., publishers, advertisers, third parties in and out of an ad exchange, etc.)." Though Yahoo’s proposed billboard would represent a leap forward in outdoor data collection, the practice is not new to the field. Clear Channel Outdoors America drew criticism from New York Senator Charles Schumer in May for operating billboards in Times Square that used mobile phone data to determine which stores pedestrians visited. The senator referred to them as "spying billboards" and urged the Federal Trade Commission to investigate the technology. "They have huge amounts of information on you," said Schumer at a press conference in Times Square in May. "Who knows what they could use it for? It’s something straight out of a scary movie." The timing of the revelation could also prove awkward for the company, which has lately drawn the ire of privacy advocates. The company admitted last month that about 500 million Yahoo email accounts had been hacked. Most recently, Reuters reported that the company has been scanning customer emails for the NSA, and last month the company admitted that at least half a billion Yahoo accounts were hacked in 2014. Jeff Tan, VP of Strategy at digital out-of-home agency Posterscope, said his company has been testing the use of mobile data and image recognition technology, and is planning on introducing a programmatic approach to enhance billboards, similar to what is described in the Yahoo patent. For two recent campaigns for General Motors, the agency targeted consumers using facial-recognition and vehicle-recognition technology. But those campaigns didn’t "store any information at all," said Tan. "The screens were not connected to the Cloud or the internet. They were all localized and nothing got saved, stored, shared or sold. All images were deleted right away." "Everything needs to adhere to protecting the privacy of consumers. 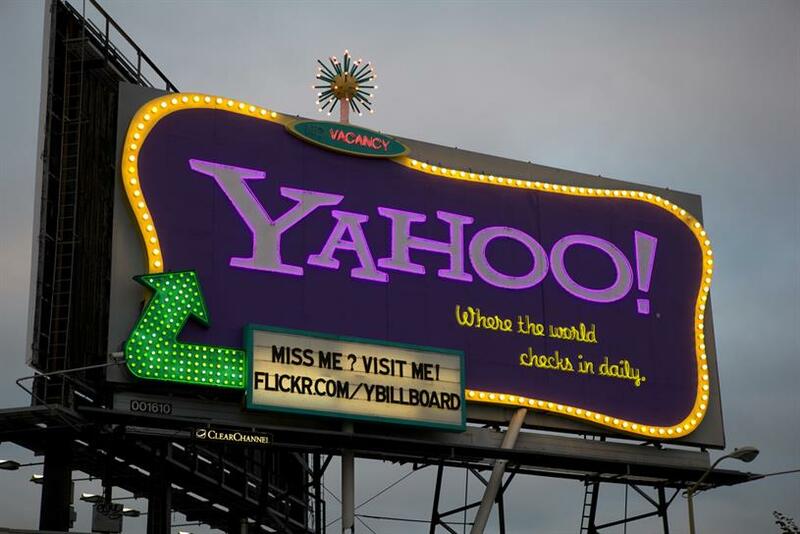 If there is a digital billboard on a freeway with cameras on it," Yahoo would be obligated "not to save, or share or sell any of the individual pictures that they would collect," he said. "And if they do, they would need to be open to any law enforcement request to access that information," he added. The AR revolution is here: Are you ready?